This Friday evening, a couple coworkers and I braved the pre-weekend rush hour commute up to Sacramento to check out the River Cats baseball game and see how Jerry bobbleheads were faring among fans. Traffic was only a few miles per hour short of a parking lot, so the game had already started by the time we arrived. When I asked the ticket taker for a Jerry figurine, he laughed and told me the bobbleheads had disappeared within the first ten minutes of the gates opening. I consoled myself knowing this was probably the only night this summer where I could be outside without needing to wear a cardigan. A true fan might cite the game's highlight as the River Cats' tying up the game at the bottom of the seventh inning, although the Iowa Cubs eventually emerged victorious. My priorities at sporting events, however, tend to center around food. The best parts of the evening for me therefore included discovering The Burrito Dog (two hot dogs, bacon, chili, cheese, and sour cream all wrapped up into one delicious heart attack) and enjoying pineapple shaved ice from family-owned Sacramento institution Merlino's for dessert. 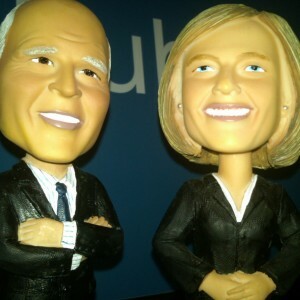 Bobbleheadpalooza has since exploded on eBay - and the Jerrys are selling for more than the Megs. Isn't irony fun? Click here for the Wordpress version.